Pond Agitation For Sale in Burlington and Hamilton, ON - Legends Landscape Supply Inc.
Pond Smell like Rotten Eggs? Your Water Needs Aeration. 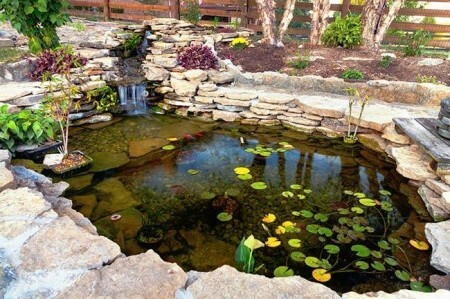 Proper pond agitation can be the difference between having a murky swamp and a sparkling pool. It is also very important if you have a fish populations that needs clean water and oxygen. The microscopic bacteria that exist in the water need oxygen to decompose organic matter, which keeps the pond healthy and clean. Oxygen is naturally diffused into the water from the atmosphere, but in many cases, the decomposition process uses up oxygen faster than it can be absorbed. Sparkling clean water also reflects sunlight, rather that absorbing it. This reduces the affects of UV light that causes algae in larger ponds. We provide two different agitation solutions: surface based and bottom based. For water that is less than 6 feet deep, a surface system is suitable (and you can also choose a bottom system). For greater depths, a bottom system will be required for the best results. Pick up the phone or visit our showroom to discuss the different solutions available to keep your pond healthy and odor-free. Our knowledgeable employees have firsthand experience with agitation systems.